Adding a terrarium into home or office décor is a wonderful way to bring the feeling of an outdoor garden indoors. Terrariums provide an undeniable springtime feel by housing a variety of succulent plants while maintaining an elegant touch with glass surfaces. Although a geometric terrarium adds interesting texture and shape to a desktop or shelf, personalizing the exterior helps create a one-of-a-kind look. Gold acrylic paint goes a long way toward highlighting the edges of a geometric terrarium. Once succulent plants are placed inside, this vibrant edging color can work as a built-in frame to draw an observer’s attention to the greenery within. Consider adding multiple plants inside a terrarium for a more natural look. The addition of a decorative crystal gives a terrarium some mystical appeal whether it sits on a tabletop or in a cubicle at work. 1. Place a glass, geometric hexagon vase on a flat working surface with the opening facing up. 2. Stick a single piece of painters tape about an inch below the top rim of the vase opening. Repeat on all four surfaces of the opening, making sure the tape is fairly even. 3. Fill a plastic paint palette with gold acrylic paint. 4. 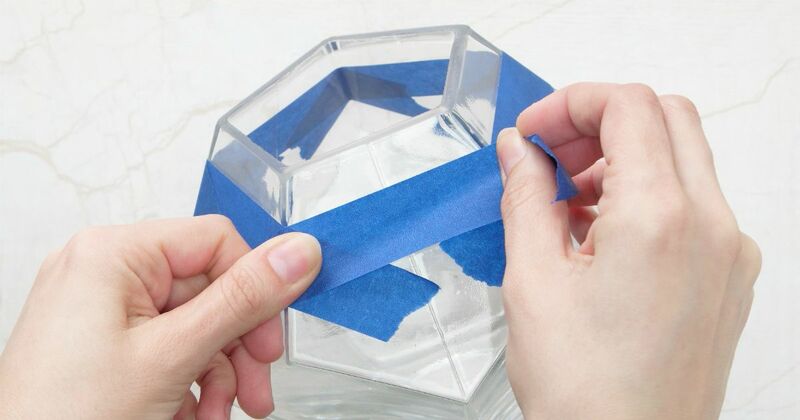 Paint the glass surface between the tape and the vase opening so all five sides are equally covered. 5. Carefully remove the painters tape. 6. Apply hot glue to the back of the wooden ring. 7. Press the wooden ring to the bottom surface of the geometric vase to attach it securely with the gold-edged opening facing forward. 8. Fill the bottom of the new geometric terrarium with the pebbles. 9. Distribute the potting soil evenly over the top of the pebbles,smoothing the surface flat. 10. Place two succulent plants in the terrarium. 11. Add a decorative crystal inside the terrarium. 12. 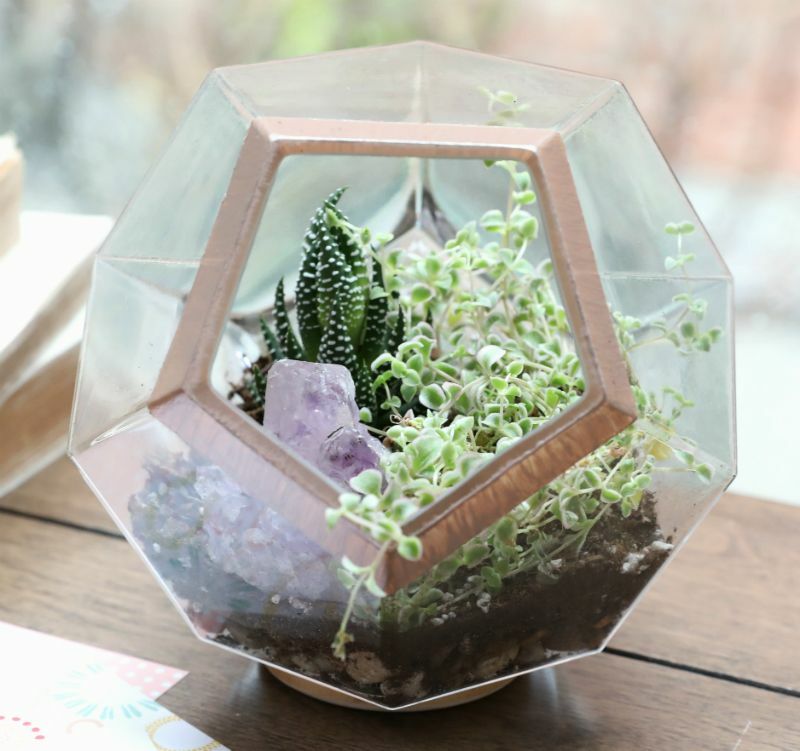 Place the geometric terrarium on a desk or shelf.